The 1870-CC Coronet Half Eagle is a rare, first year of issue gold coin from the Carson City Mint. The Carson City Mint began operation in 1870. Gold coin production numbers during the first year were very low, as Comstock Lode miners deposited no more than $175,000 of gold ore, just enough to strike a combined total of 17,372 half eagles, eagles, and double eagles. Carson City silver coinage saw paltry production too. Contrast this to the San Francisco Mint, which struck more than one million gold coins in 1870. Ever since, coin collectors have considered the 1870-CC Coronet Half Eagle as a very rare, highly desirable acquisition. Only 7,675 were coined, of which less than 100 exist today. As is nearly always the case with Carson City coinage, the 1870-CC Half Eagle also carries the allure of the Old West, an attraction many coin hobbyists find irresistible. It seems as if the 1870-CC Coronet Half Eagle for years did not receive the attention it really deserved. The blue line above charts the percent value increase of the 1870-CC Half Eagle, using Jan 2000 as the baseline. The value languished throughout the decade, then finally exploded in the middle of 2009, almost catching up to the level of the Rare Coin Values Index, as shown by the red line. The Index is a composite percent increase measure of a group of 87 coins chosen to represent the spectrum of rare US coins. The idea of having the Index is to get a feel for how well the rare US coin market is doing. 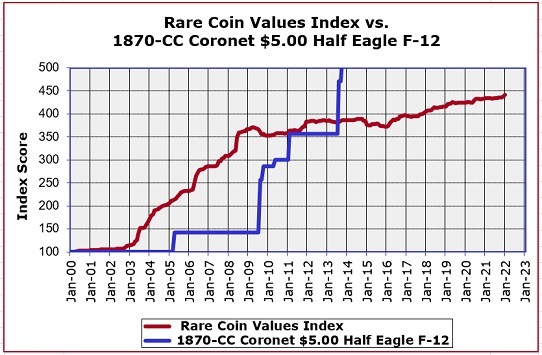 The 1870-CC Coronet Half Eagle is one of the 87 coins tracked in the Index. All Index data is updated monthly.